Guys, I am sooooo excited! This is like the culmination of most of my metal dreams for many years now. First, Guardian+Whitecross announced they would have a new version of "Never Gonna Say Goodbye" by Guardian, which thrilled me to no end! Now, today April 10, they have announced that they are re-recording "In The Kingdom" by Whitecross. I am thrilled with this news as it is my most favorite Whitecross song. Hope that they continue to make money so it can possibly get more songs added to it! deathisgain wrote: They should redo "Holy War"
In The Kingdom is far and away the best ballad Whitecross ever did, and the rough version that was posted with Jamie singing and Rex playing acoustic guitar sounded excellent to me. To be honest, In the Kingdom is the only whitecross ballad I care about. Funny thing, when I am in the mood for ballads, I usually go for Guardian. BTW, cool to see that they are doing Never Say Goodbye, as well, but I would rather having a full hard rock album. Another thought that comes to mind is: though we all would like to have at least one brand new song, we got to understand that, the main porpuse of this project is to show the availability of the band for concerts and tour. That's why they want to make an ep of redone songs, to make it fast and simple. So, new songs are off the table for now. I don't mind it, as long as they come to Brazil for a concert. They shared a snippet of the remade "The Rain" and it sounds fantastic! It's got a scorching solo! Got my download this morning, anyone else got this and if so what do you think? Let's hope this is the start of something.... maybe original music in the future. Enjoying this release for the time being. The Rain sounds great, except the chorus. They butchered the chorus! But everything else about that song is awesome here. Enough is Enough is solid. Top of the World was an unexpected choice, but sounds really good. The one new song - Spanish Castle Magic - is okay. It doesn't really sound like the other songs on this album. Overall I'd give this a 6 or 7 out of 10. In the Kingdom is blowing me away. New Creation wrote: In the Kingdom is blowing me away. This is a great version of that song. I forgot how good a song that really was. Outstanding message. This acoustic version works really well. Think Jamie Rowe's voice really suits this 'In The Kingdom' perfectly, sounds awesome!!! Probably my favourite song on this record. I don't really care for the last 2 tracks but overall would give this EP a 7 out of 10 as I really only enjoy the first 5 songs. Like FOJ said the chorus on 'The Rain' doesn't sound as good as the original but never the less is still a good song overall. I'm really digging the entire album (well not the Spanish language track so much). While a little different vibe than the rest of the tracks I found the cover of Hendrix tune quite enjoyable as well. Would be cool to hear them do even more covers. I also agree with everyone else concerning the acoustic version of "In the Kingdom" it works really well in this arrangement. If they would write some band parts where the rap stuff was and actually sing that, it could be cool. The opening riffs, the parts where Scott sang, and the chorus were all cool. I am listening to this for my first time right now. They definitely nailed "Enough Is Enough". "The Rain" doesn't quite feel right on the intro but comes into its own during the main part of the song. I realize that this record was most likely made to guage to see if there was enough interest in doing a new album. I am disappointed that they didn't include anything new. I do hope that this does lead to something more in the future, though. Oh no I didn't pledge/participate! Is there any other way to download the EP, like Itunes or Amazon? Baddog777 wrote: Oh no I didn't pledge/participate! If you go to the store section of their webpage it looks as if they are planning to have both digital and cds available in the future. The band nails the Whitecross songs for the most part. I didn't like "In The Kingdom" as they kept it acoustic and you never got the hair metal ballad feel. Also, Jamie's voice is sounding strained on it. I got the impression that Jamie was struggling with his higher end on the vocals. If they do any new material in the future, he definitely needs to stay in the middle range where his true power lies these days. Well, the EP is out, and they are working on the other goods. But what about the concerts??? After all, the opportunity of playing live was the main reason for this campaign. I am going to guess that the opportunities to play live didn't materialize with them just rehashing older songs. They NEED to do a full length album of all new songs with maybe a couple of redone classics on the record. Any sound samples floating around? alldatndensum wrote: I am going to guess that the opportunities to play live didn't materialize with them just rehashing older songs. They NEED to do a full length album of all new songs with maybe a couple of redone classics on the record. Agreed. Apparently they have chosen the easiest way. But I still have high hopes for them to come to Brazil, as it all started with a Whitecross and Guardian concert request from Brazil (their website says so). MikeInFla wrote: Any sound samples floating around? amazon now has snippets of the album. It's called "The Great Whitecross & Guardian - Revival". I only cared for about 2 of the songs. Might download those 2. I pledged for the vinyl. I never received the vinyl. Now I get a message in my email today from Boone's Overstock that they will release the CD and vinyl of this in 2018 as they "bought all the remaining copies after the supporters receive their product!" Well, I never received my product. So how can Boone do this? Hmmm that's odd, I would first contact whoever held the pledge and then contact Boone and both of them know you never received it. Well, i just pledged a cd and I got it. New Creation wrote: I pledged for the vinyl. I never received the vinyl. Now I get a message in my email today from Boone's Overstock that they will release the CD and vinyl of this in 2018 as they "bought all the remaining copies after the supporters receive their product!" MikeInFla wrote: Hmmm that's odd, I would first contact whoever held the pledge and then contact Boone and both of them know you never received it. We just got notice! We are supposed to finally get the Vinyl next week. Any orders that have vinyl will then ship asap. Sorry for the delays but this has been something we could not control or forecast. Thanks all for your patience! Great keep us posted! Would like to know how it sounds on vinyl. Hopefully better than the CD. After months of owning this, I am completely underwhelmed by it and go back to the original band recordings instead of this if I want to hear the Whitecross or Guardian songs. These guys need a life of their own with new tunes. As I said before, the only purpose of this release was to help them to play concerts out there As Guardian Whitecross revival. So, the only mandatory thing was to release it properly wth good sound quality. and they've nailed it. With this in mind, I am very pleased with the final result of it. But of course, every fan in the world of one of these bands would rather see new material from them. Thiago-Brazil wrote: As I said before, the only purpose of this release was to help them to play concerts out there As Guardian Whitecross revival. No, but certainly due to the lack of interest from promoters. It is sad to say, but it looks like it didn't work out as they expected. If you take a look at the videos and website you will see that all they talk about is to go out and play. I was a little pessimistic about this project so I didn't participate in the crowd funding. I'm an old school guy, loved both bands and had the opportunity to see both bands live back in the day. But after reading some of these comments and hearing the snippets on Amazon, it sounds pretty good to me. Enough is Enough was one of my favorite Ratt..err, I mean Whitecross songs back in the day. It sounds really good with Jamie singing on it. Will make the purchase on Google Play since it is only $6.93 and I have this Google gift card I've been saving for something like this. In the Kingdom sounds pretty good too, even though I didn't really care for that song when it came out. Reminded me of "We are the World" too much. The new version of In the Kingdom is a little better than the original IMO. 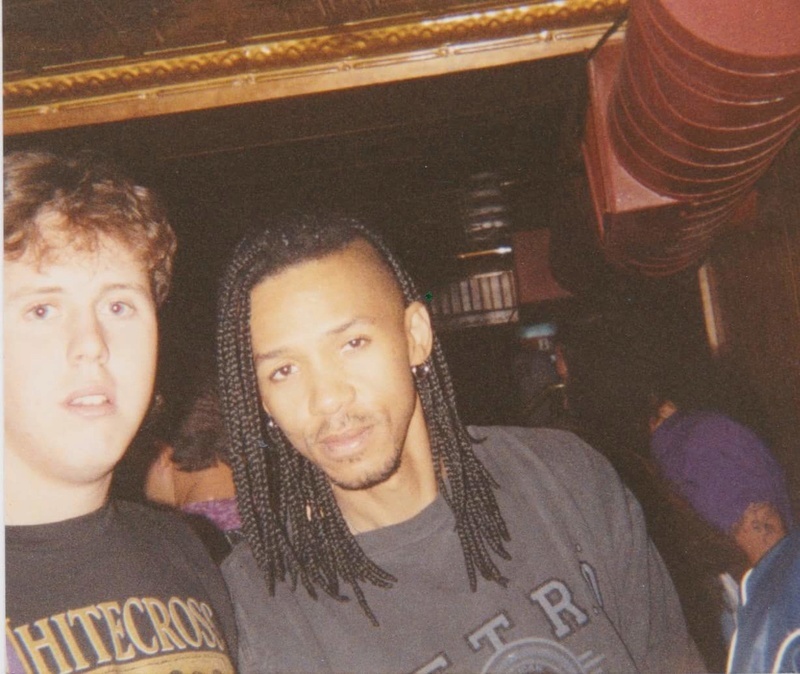 To prove I'm old school, here's a pic of me with a Whitecross "In the Kingdom" shirt on (got at their show in Houston a few months before this), with Doug Pinnick(King's X) at a Bloodgood show in Houston around 1992. Doug was just there chilling watching Bloodgood before I rudely interrupted him for a pic! I finally got the record and cd in the mail. I had given up on these ever arriving. I have had the download version for a long time. When is the release date? I hear the album on you tube and it's pretty good. It's on pre-order at boonesoverstock. I agree. The mix is incredibly muddy, the guitars sound buried and too thin at times, and the vocals sound strained from time to time (even noticeably off key here and there). Then when the background vocals kick in... ugh. Too high in the mix and just don't sound right. Spun this the other day...it isn’t aging well. I can’t imagine ever pulling it out again. When I want these songs, I’ll go to the original Guardian or Whitecross albums. Just picked this up from the Roxx Labor Day sale (yeah I'm late to the party). This record reminds me of the "Yellow And Black Attack Is Back" cover album that Guardian did years ago. As as one-off tribute to Guardian and Whitecross songs it kind of works. As a launching pad for them to record new material, not so much. I like Enough Is Enough and Top Of the World. Jamie's vocals really kind of fit on those songs. And I really like the acoustic version of In The Kingdom. Not sure this will end up in regular rotation for me, but it's an enjoyable listen.